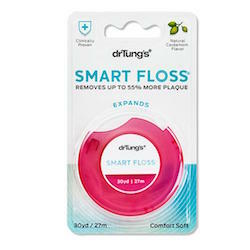 There's no other floss quite like Smart Floss. It stretches and expands into inter dental spaces for better removal of plaque and food particles. This high-performance floss is suitable for everyone - people with tight spaces, wider spaces...even braces. Directions: Wrap 18" of floss around fingers and draw tight. Tug & release. It expands! Slide floss between teeth, curve it around tooth and clean between tooth and gum with gentle up and down motion. Repeat using a clean section between each tooth. Also works with braces and wide spaces. Ingredients: Natural plant and bees wax coating.